MMPC’s brochure provides useful information about bed bugs, with prevention tips for individuals, families and professionals on how to stay bed bug free. The brochure also discusses eco-friendly treatments, canine bed bug inspection and related legal issues for tenants and landlords. 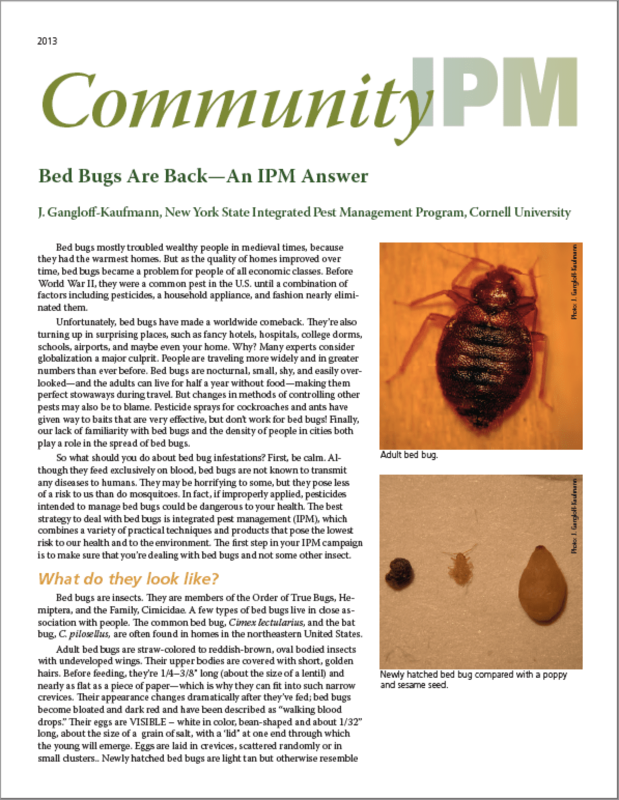 This fact sheet, created by the New York State Integrated Pest Management Program in collaboration with Cornell University, provides comprehensive information about bed bugs and their behavior, including prevention and treatment options. A detailed fact sheet on the lifecycle of bed bugs, complete with images, compiled by the Department of Entomology at Virginia Tech. How can I stay bed bug free during a move? In this podcast, Jim Rueda, owner of Moving Right Along and founder of Bedbug Busters, shares tips on how to prevent bed bugs during a move, and discusses fumigation strategies to treat bed bug infestation. What are tenants’ rights when dealing with bed bug issues? In this podcast, Mario Mazzoni, Organizer and Vajira Kilgore, Vice Chair of The Metropolitan Council on Housing share important information about legal rights when dealing with bed bug issues. To learn more about the legalities around bed bug-related issues in New York City, visit the “Legal issues” section of our FAQ. Careful preparation must be taken before bed bug treatment and extermination, to keep you and your belongings safe, and to ensure the best results. This podcast from MMPC provides preparation instructions for personal possessions and furniture. In this podcast, Lou Sorkin, a Board Certified Entomologist who has been with the American Museum of Natural History since 1978, discusses the physical characteristics of bed bugs, their behavior, lifecycles, bed bug bites, why bed bug infestations spread so quickly, and how to educate yourself to prevent infestations. More helpful bed bug information from Lou Sorkin, Board Certified Entomologist with the American Museum of Natural History. In this podcast, Lou discusses why bed bugs have become such a problem in New York City in recent years, how Canine Inspection works, what steps travelers can take to prevent an infestation at home, and what to look for when selecting a pest control company. 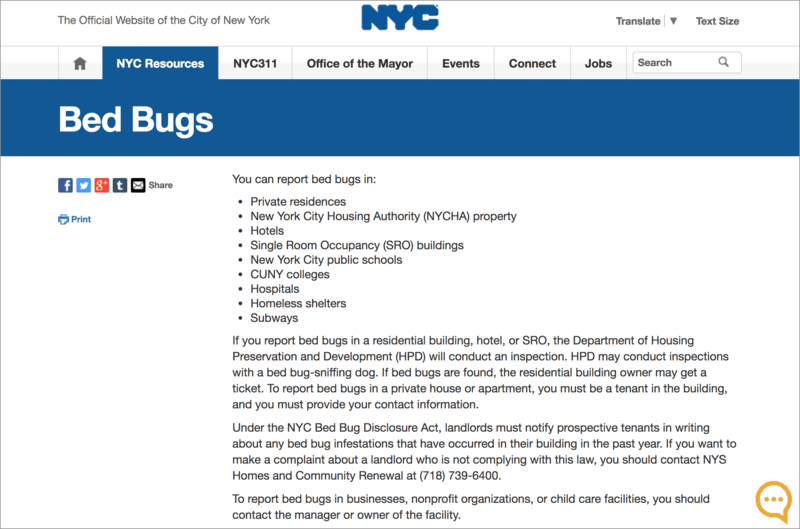 If your landlord is not doing their part to maintain a bed bug free apartment building, or if you need to report an infestation, you can do so here. This page also contains links to information about bed bug identification and control, and educational resources for bed bug related building management issues. 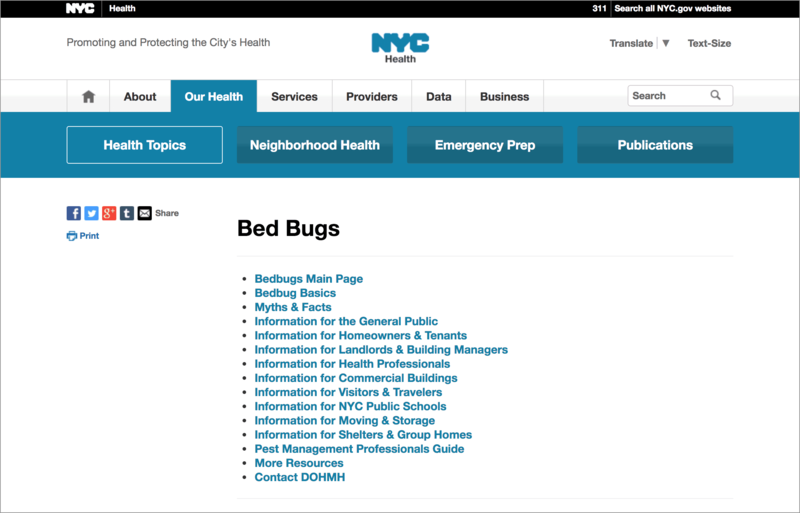 The New York City Department of Health’s comprehensive bed bug information resources page, with answers to all your bed bug questions — from laws for business owners and landlords to helpful prevention tips. Met Council on Housing: Don’t Let the Bedbugs Bite! The Metropolitan Council on Housing is a non profit tenants’ rights membership organization that fights for access to safe, decent, affordable housing. 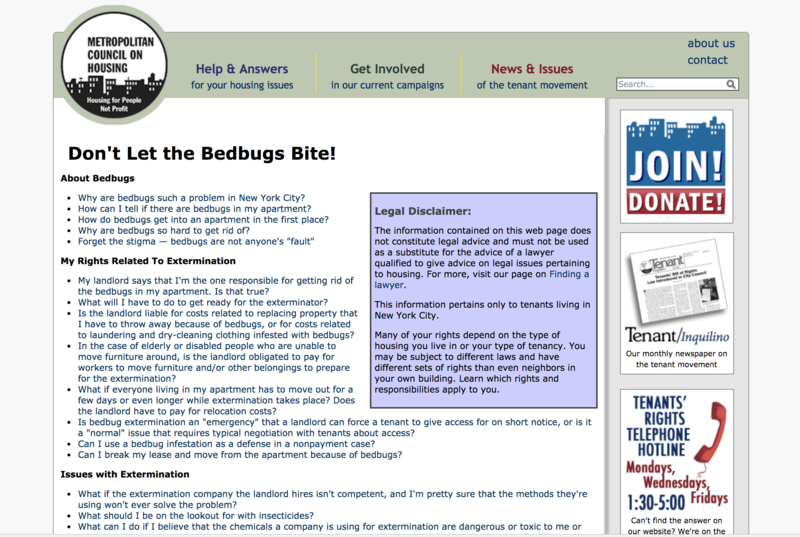 Their bed bug page answers dozens of questions about bed bugs, from tenant and landlord rights to methods for eradicating them. The Centers for Disease Control maintains a thorough and detailed database about parasites and other pests. Their bed bug resources page features links to FAQs and information about bed bug biology, publications and resources for health professionals. 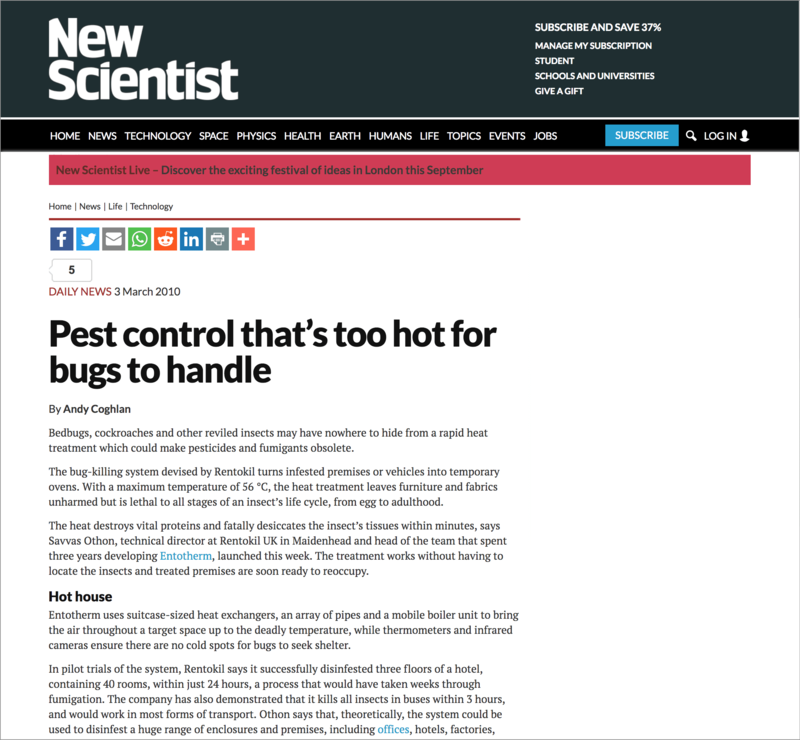 This article, from a London-based magazine covering all aspects of science and technology, discusses the process, benefits and effectiveness of rapid thermal heat pest control treatments. 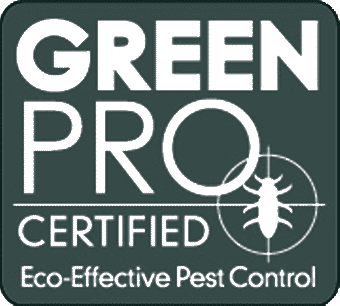 An article about bed bug resistance to pesticides, from the blog of Beyond Pesticides, a nonprofit organization which works to promote and create a world free of toxic pesticides. 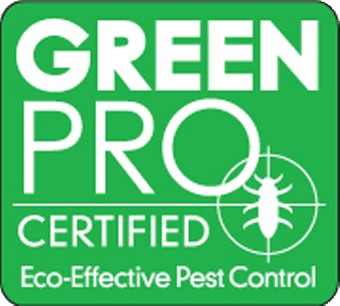 The article provides insightful information about green alternatives to pest control and the long term benefits to this approach. Freezing is one of MMPC’s eco-friendly pest control methods, and this article discusses cryonite in detail — what it is and how this technology works — along with its uses, benefits and application.